Suitable for use with chains with up to 13 mm wire diameter and elongated end link ("noose" type ring). Body: one-piece, special case-hardened, tempered steel. Finish:"NIPLOY PROCESS" corrosion-proof nickel plating. Dead-bolt: Ø 13 mm case-hardened, tempered steel rotating resistant to attack dead-bolt. Grip with programmed breakage dead-bolt head, to prevent the dead-bolt being pulled-out. 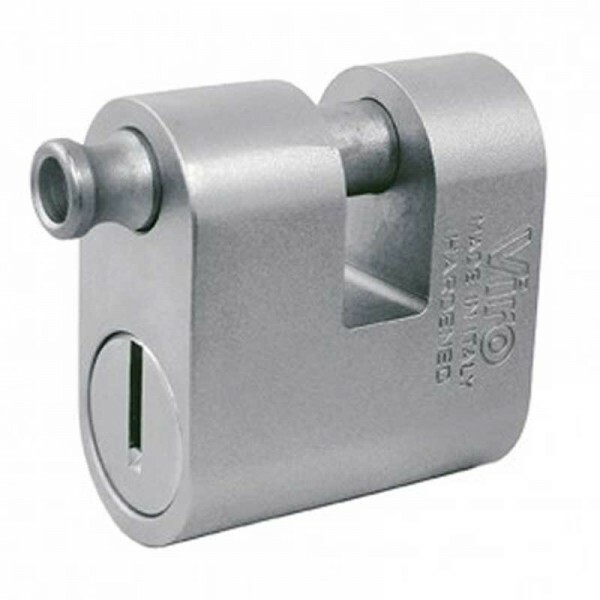 Security cylinder: "Thor": 7 pins, replaceable and re-keyable, protected by a rotating burglar-resistant, anti-drill plate in special case-hardened and tempered 4.4 mm thick steel. Keys: supplied with 2 Viro Top Security profile nickel-plated brass keys.